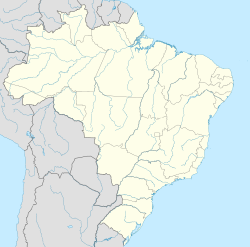 Brumadinho (Brazilian Portuguese: [bɾumaˈdʒiɲu]) is a Brazilian municipality located in the state of Minas Gerais. The city belongs to the Belo Horizonte metropolitan mesoregion and to the microregion of Belo Horizonte. Brumadinho is located at an altitude of 880 m. In 2010 the population was 18 534. The municipality is located on the Paraopeba River. The Inhotim Museum of Contemporary Art, one of the most important art venues of Brazil, is located in the city. The municipality contains part of the 3,941 hectares (9,740 acres) Serra do Rola-Moça State Park, created in 1994. Brumadinho was settled in 1689. The Banda São Sebastião Musical Corporation, a symphonic band, was founded on 13 May 1929 by Tarcilio Gomes da Costa in Brumadinho. The municipality of Brumadinho itself was officially established on 17 December 1938. On 25 January 2019, the city was the victim of a tailings dam collapse that killed at least 186 people. The disaster released a mudflow that advanced over houses in a rural area near the city. ^ "Área territorial oficial" [Official Territorial Area] (in Portuguese). Brazilian Institute of Geography and Statistics (IBGE). 2002-10-10. Retrieved 2010-12-05. ^ a b "Estimativa População 2013" [Population estimation 2013] (PDF) (in Portuguese). Brazilian Institute of Geography and Statistics (IBGE). 2013-08-29. Retrieved 2013-08-29. ^ "Ranking decrescente do IDH-M dos municípios do Brasil" [Ranking of HDI-M of Brazilian Municipalities] (PDF) (in Portuguese). United Nations Development Programme (UNDP). 2010. Retrieved 2013-08-03. ^ Phillips, Dom (26 January 2019). "Brazil dam collapse: hundreds missing after mining disaster". The Guardian. Retrieved 26 January 2019. Wikimedia Commons has media related to Brumadinho. Wikivoyage has a travel guide for Brumadinho.